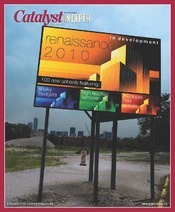 I am a big fan of Catalyst Magazine, a periodical that does independent reporting on urban education. They recently ran a series of articles in response to the film “Waiting for Superman” (you can read my review here). There were two different articles that I really liked, especially if you read them in conjunction. The first is entitled, “Poverty at the root of our problems in our schools.” You can read the entire article here. I think this is worth talking about, because poverty is most certainly a collision of multiple factors and is therefore requires a creative, enduring, and multi-layered approach. Too many conversations about education focus on where the problems have come from and where to affix the blame, instead of the very real, very positive, very measurable case for immediate, focused action. Let’s use America’s natural optimism and “do something” attitude to propel us forward into a future where we are in the top 10 for both math and science. Let’s build a foundation through our school system where kids are able to learn, thrive and graduate from high school on time, ready for college and work. It starts with every one of us and it requires the support of all segments of our community: corporations, non-profits, governmental leadership, organized labor, parent organizations, community leaders and every resident who cares about the future of our children and our country. Taken together, I believe these two articles represent a very holistic way to approach poverty. On one hand, it is a complex and scary reality, and simplistic approaches are never going to change anything. On the other hand, education is the single most effective way to help children create a new future when they are born into impoverished situations. We should all be concerned about educational inequality, and all consider ways we can be part of the solution.